Golf grips are one of the most important accessories in the game that can influence your performance as a player. To improve your chances, it is important to buy one of the best golf grips available in the market. If you are using your golf grip more often, chances are that a new pair will be required soon. The wrong grip can kill your chances at the game. Before you buy golf grips you should understand the various options that suit your specific need. Using the right golf grip will help you to achieve ball control, accurate spin, long-distance shot, and other goals in the game. This best golf grips review will help you to make the right decision while shopping for the best golf grips. How Important are Grips in Golf? What Size of Golf Grip Suits You? 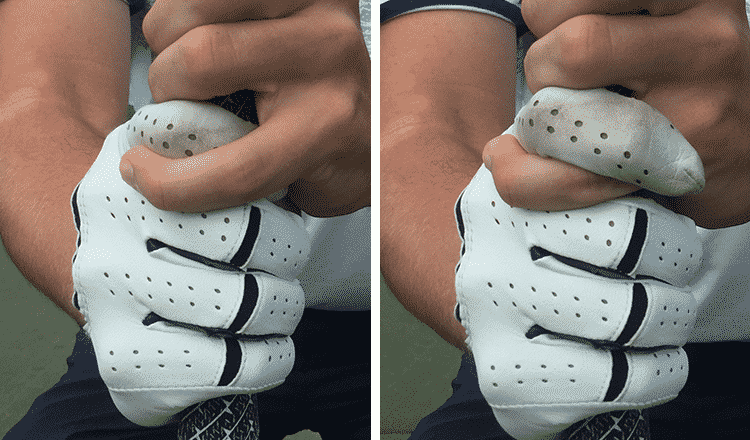 How Do You Change Your Golf Grip? Holding the grip is one of the first lessons that a golfer receives. It starts by learning how to swing and knowing how to grip the club. It is difficult to make good and consistent shots in golf if the grip is not held properly. Many new and intermediate golfers may be using the wrong grip ignorantly even though it may feel a little comfortable in the hand. You will be able to have an efficient control of the golf club if you are using one of the best golf club grips. While you are swinging, you should tenaciously hold onto the club and the hands should not slip. The last three fingers of the left hand, the middle fingers of the right hand and the ring should supply the main grip pressure. Having a sound grip will make the two hands work in unity to building a strong swing that can lead to a more accurate shot. Most golfers make the mistake of holding too tightly to the club. This method of gripping increases the tension in the forearms and the shoulders and consequently limits your swinging capabilities. You will have more power and clubhead speed if you maintain a low gripping pressure while yet holding the club securely. Consequently, your ball flight will be determined by your grip. Also, how your hands are positioned on the club will affect the left to right flights of the ball. You need to develop the skills of how to curve and bend the ball in any direction. While a weaker grip will encourage the ball’s flight, a stronger grip will slice; either of the two gripping skills will be used in club control. Don't confuse yourself with the gripping styles and grip types. Here is all you need to know about different golf grips. Rubber grips have become the most popular nowadays. However, some additives can be provided to change its condition and feel. Before now, golfers relied on wool grips until leather grips became the norm even though it did not last. 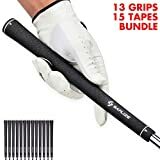 Rubber grips are the most recommended golf grips for beginners. These are rubber grips with a brush-like cotton fiber that gives it a coarse feel. The full cord style corded golf strips have the cotton fibers sticking out on the entire grip while the cotton strips are laid half-way on the grips in the half-cord style. While some golfers do love the cord grips for its moisture-wicking feel which allows them to hold the clubs with confidence, others dislike the abrasive feel citing its tendencies to cause blisters on the hands. The only disadvantage of using cord grips is that it wears out faster which implies you will have it changed more often. However, it is still the best golf grips for sweaty hands. Wrap golf grips are rubber grips designed with thin strips of leather wrapped around it. It has the advantage of allowing you to rotate your hands to any direction on the grip without experiencing a change in the feel since the texture remains same throughout. In addition, it has an easy installation because of the smoothness of its alignment when compared with other grips. The main material for the construction of lightweight golf grips is rubber. However, as the name implies, they are lighter than other grips. Most players are not comfortable with its low-weight because of the absence of proper counterweight to enhance the feel which is required for a full head swing. However, lightweight golf grips are the best golf grips for seniors and players whose swings are slow. The putter grip is different in style, design, and thickness from the regular traditional grips. They are not like the simple, thick, round and tapered grips. The Putter grips are of several sizes and make. Generally, they have less traction and are not designed to be swung with a great force. Your grip size depends on the size of your hand. This is measured from the wrist up to the middle finger’s tip. Grip sizes may vary from one manufacturer to another, however, they are based on one of these standard sizes. It is possible that you may still be uncomfortable in any of these sizes. This is the reason many players choose to attach some layers of tape on the grip or shaft. A single wrap of tape will increase the size of the grip by 1/64-inch diameter. Most players prefer a thicker grip which is the best golf grip for arthritic hands and can choose to add more wraps of tape either at the bottom or top of the grip. 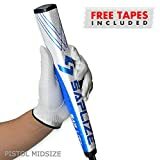 Midsize golf grips are not easily found on the market which is the reason most golfers add the tape layers on the undersize to get their required feel. The Jumbo size golf grip is primarily used by golfers for putters. However, your grip should be just the right size for you. Once you don’t feel right on it, then you are not using the right golf grip size. This size of the grip is the first thing that should come to mind when you are shopping for the best golf grips. If you select a wrong size golf grip, you will feel very uncomfortable and this might slow down your progress in the game. It is either you find the size that fits perfectly out of the four sizes in the market or you increase the grip’s thickness by wrapping some layers of tapes around it. Your ability to maintain a firm grip on the golf club depends on the material makeup of the grip. The most widely used golf grips are made of rubber. However, you can still get golf grips that are made from either leather or other compounds. Firm vs Soft – while firm grip textures are needed for high-speed swings and ball control, the soft grip makes it easier and comfortable to hold the grip. The firm grip allows you to hold the club with little pressure. However, the golf grips for beginners and seniors is one with the soft texture. Round vs Ribbed – You will discover that all grips for woods or iron are either ribbed or round. A round grip has a symmetrical design while grips with ridges throughout its length are ribbed. This design allows players to position their fingers on the grip properly. The amount of swing speed which you have depends on the firmness of your grip. While professional players prefer a firmer grip, a softer grip is best for beginners. This is the most essential factor to consider when buying a new golf grip. If you don’t feel the comfort in your hands while taking the shots, then you have bought the wrong grip. If the texture is too soft or too coarse such that it could cause some injuries to your palms, then it is not good for you. sometimes, the size may be too big or too small for your hands. Once the feel is not right, that means your comfort has been compromised. The best golf grips should be comfortable enough to improve your performance in the game. You should consider buying a golf grip that can be maintained easily. Grips that can be easily cleaned or washed with detergent after each use will last longer. If it appears that the grip demands more than you can offer for its maintenance, then you should consider getting a new one. Golf grips are of different sizes, materials, textures, and prices. 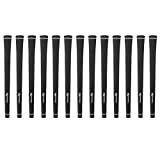 It is obvious that some of the top rated golf grips are relatively expensive. However, there are cheap golf grips that can still help improve your performance just like the branded or expensive ones. There is nothing wrong with spending a little more to purchase a grip that you feel comfortable with. Although your budget matter, quality and comfort are always more important. At first, we went online and did 15 hours of research to know everything about the most renowned golf grips in the current market. First we listed down 26 products from the reliable brands that people were buying and using regularly. Then our team began testing all of them one by one with the help of a volunteer group that included friends, families, and the local golf fanatics to examine how each of the grips fared under various conditions. Our volunteers also cut across persons of diverse age, gender, and body size. We also contacted a few professional golfers who had several years of experience of using different brands and models of golf grips. They recounted their experiences and opinion on each of the various golf grips they have used. Based on our practical experience and the feedback from pros and volunteers, we shortlisted top 15 golf grips. 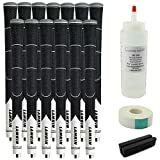 Then we searched the web again for reviews on the best golf grips to buy and examined the comments and ratings from customers who had bought and used these products. After we gathered the necessary information, we developed the list of factors that could help us to compare each of the products over another. The parameters for our comparison included grip size, grip texture, grip material, comfort, grip firmness, price, and maintenance. We compared how one product rated over another before we came up with our conclusion and prepared the final list. So, you can be very confident in this golf grips review because of the exhaustive research process that was incorporated into its preparation. We have compiled the list of our top 10 golf grips after analyzing and comparing the products based on factors like durability, texture, firmness, size, comfort, and price. This guide will help you to explore the golf grips and then choose one with the best features which you desire. We analyzed 14 of the most important features that any top-class golf grip should have and we found this Putter Grip with the maximum number of these essential features to achieve the best scores in the game. Despite being the top performer of our selection procedure, it comes within a very affordable price range that made it our most-favorite. This one of the most popular golf grips with the Parallel Technology that helps golfers put even pressure in both hands, thus eliminating enhanced tension in the forearms and wrist. This unique feature invoked us to put this tour-proved (PGA tour) putter grip on top of our list. The SuperStroke Slip 3.0 Putter Grip is made to offer you the best grip for touch, control, swing, and precision. It has a diameter of 1.3-inches and is design to help limit the tension on your hand muscles; thanks to the new parallel technology. It is the most widely used golf grips since it allows for a parallel hand placement which helps to build your confidence in the grip. You will appreciate how balanced your swings becomes as it prevents your wrist from causing any swing interruptions. This grip is designed to help you improve your skills greatly. It features a lightweight foam which has been enhanced by an additional PU material to enable you to have a comfortable feel. Another fact that is worth mentioning is that this model approved by the USGA implies that it is safe for use. In addition, it comes in various colors that can match with your sporting outfit. If you are interested in enjoying the amazing benefits of a putter golf grip especially the ease of swinging or an enhanced pendulum stroke, then this product is for you. There is a balance in pressure between the hands. It prevents a build of tension in the wrist and forearms. It is not very suitable for golfers with slippery hands. The SuperStroke 3.0 Putter grip is top on our best golf grip list. 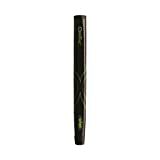 It is the most popular and widely used golf grips. It features the parallel technology which is responsible for the balance of pressure in both hands and helps prevent excessive tension in the hands and forearm. It gives a very comfortable feel, thanks to its slim nature and lightweight foam. We recommend it for any professional golfer who is interested wants to achieve better strides in the game. Why Is This Our Runner-Up Pick? This is another exclusive golf grip that comes with a reasonable price tag. This is the second cheapest grip on this list with a lot of important features that any golfer seeks in their golf grip. It also offers cushioning and high sock absorption with the unique WinnDry polymer that brings in comfort, and non-slip operation in all weather conditions. Also, it had the highest number of positive reviews compared to all other low-cost grips on our list. The combination of these effective features within a low price range made it our 2nd best choice on this list. This is of the best quality among the cheap golf grips in the market and comes with exciting features to enhance your career in this game. It is made from special materials that not only help you reduce swing tension but offer you a comfortable grip even in humid weather as well. When it is wet, the material becomes tackier that enhances your grip. Another interesting thing about this product is that it has a very good shock absorption rating. In fact, its absorption rate was 65% better than other grips we tested. In addition, it is the best grip for golfers living in rain-prone regions. They are very lightweight, making it the most ideal golf grips for iron. Also, it is very comfortable in the hand especially for those that have problems with fatigue. We also liked the various sizes and make that come with this model, which allows you to choose the category that suits your size and gender. So far, it is among the most affordable golf grips in the market. Finally, this product is designed to offer you an excellent swing control with the club. This product is designed to provide you with tackier slip during wet conditions. It is very suitable for golfers in the rainy season. In addition, it comes with various sizes that allows you to choose the one that will give you the best grip and feel. It is recommended for both beginners and senior golfers who would not prefer much tension in their swing; thanks to its high impact absorption rate. Why Is This Our Best Grip Set? 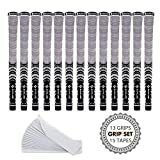 We have selected this golf grip as the Best Grip Set because it comes as a set of 9 or 13 pcs of grips with a number of pragmatic features. The most crucial of them are its comfort and durability. This mid-sized grip fits very comfortably in hand and provides a superb feel and traction at the time of holding. Also, the sock absorption rate of the grips of this set is moderately high than most other items on this list. Also, these grips last long as they are made with high quality polymer. So many advantageous features of this grip set convinced us to place it as one of the top golf grips. This is another great model from the Winn Dritac Company. The amazing features of the set 9 Midsize golf grip are what makes it one the best golf grips in the market. One of the things we appreciate about this product is that it fits comfortably in the majority of men’s hands. In addition, it provides you with excellent feel and traction while holding the grip. Whether you prefer interlock or overlap grip, you will surely like the contoured texture pattern of the grip. Another interesting thing about this model is its ease of replacement. They come in sets of 9 or 13 grips per pack which makes the replacement process easier. In addition, the wraps can be adjusted to suit your hand size. As can be seen in other products from DRITAC, this model features one of the best shock absorption rates. Also, it can be used in any weather condition, making it the ideal choice for golfers with sweaty hands. Many users like the mature black color of this grip since it tends to blend with any sporting wear. We cannot ignore the soft feel that this product offers to its users. Those with problems with arthritis will find it to be more helpful. Moreover, it is made with polymer material for enhanced durability. If you are interested in a product that builds your confidence and swing abilities without compromising on your comfort, then this product is for you. This midsize standard golf grip is designed to fit comfortably in the hands of adult men. It stays cool and become tackier when wet. An interesting feature of this product is its soft feel which allows you to swing without much tension in the wrist and forearm. It is very easy to maintain as it comes in sets of 9 or 13 which allows you to replace with a new one when you no longer feel the grip. Why Is This Best for Beginners? Developing skill in any field takes some time. When we tried to find out a suitable golf grip for the beginner golfers, we found this product that meets the criteria for being the best choice for beginners. The outer layer of this lightweight grip is made with Tacky Polyurethane which provides the maximum comfort level. Its cross-traction surface texture prevents the golfer's hands from slipping in hot climates. Also, the Super Stroke Technology of this USGA-approved grip ensures consistent strokes. This product holds the maximum number of hassle-free features than the other products on our list, making it suitable for all beginners. The SuperStroke Slim 3.0 Putter Grip Oversized is one of the best golf grips for wrist movement. It has a diameter of 1.3 inches and a length of 10.5 inches. The outer layer is made of a tacky polyurethane material which enhances its grip on your hands as the game progresses. This product uses the 'no taper' technology to provide you with a firm grip which is needed for a consistently enhanced stroke. Another feature which we liked about this model is its grip texture which is designed to save your hands from slipping during wet conditions. In addition, the grip is made of EVA foam which does not only gives it the lightweight feature but provides you with a comfortable feel. It will interest you that this product was the most widely used Putter grips in the last PGA tour. You will also like the parallel technology which is common in Putter grips from this company which helps to prevent the buildup of tension in the wrist and forearms. The SuperStroke Slim 3.0 Putter Grip Oversized is durable, tacky and easy to maintain. It is designed to provide every you with the necessary encouragement to grow in the game. This product has been the best choice for a beginner’s golfers. It is made of the best gripping materials which are responsible for the tacky feel. The surface texture is designed to provide you with a firm and non-slippery grip. It can be used under wet conditions which makes it useful for persons with slippery fingers. It is lightweight and feels very comfortable in the hands. It is one of the most popular golf grips among professional and beginners’ golfers alike. Why Is This for the Pro Golfer? This is the only grip in our research that provides you the opportunity to represent your team with your preferred logo that may help you keep a superb team spirit. But that's just an added feature. What makes this an advanced choice is its unique design that helps control the direction and speed with ease. Also, its enhanced rubber construction provides great durability and comfort with very low maintenance. Although this golf grip is slightly pricier than most of the grips available, its such unique features make it an advanced choice, and rightfully so. Team Golf NCAA Golf Putter Grip is the choice to make when you are representing your team. It is multicolored and designed with various logo to match with your team. It is the best grip for the display of an exciting team spirit. They are made from enhanced rubber materials which are the reason for its excellent durability and ease of maintenance. This model is textured to provide you with a sturdy grip to enhance your swings. What we liked about this product is the customized design that they have for every college and comes with a removable gel top ball marker for the team. Another interesting feature which cannot be ignored is the thickness of the grip that gives you a comfortable feel needed for a powerful but low-pressure swing. You will also appreciate the contoured grip which allows each hand to fit perfectly while swinging the ball. As a golf lover, you want to get the best output from your golf equipment, whether you buy a golf rangefinder or a golf grip. And the Team Golf NCAA Putter Grip can satisfy you from this perspective because it's specifically designed to help you in controlling the speed and direction of the ball with ease. In addition, it can withstand shock which helps prevent a buildup of tension on the muscles of the hand and wrist. This product comes with the best features to provide you with a thriving team spirit. It comes with various colors and logos which represents each of the participating college teams. We liked the contoured grips which are responsible for the firm grip you need for an accurate and powerful swing. Additionally, this product is made from the best materials available to increase its lifespan and reliability. Moreover, it is lightweight and relatively slim to give you that comfortable feel. Over 125 PGA Tour players made the SuperStroke Fatso 5.0 Putter Grip their top golf grip because of its excellent features. It has a very thick putter grip that can enhance the dynamics of your game. One of the major reasons it is included among our list of the best golf grips in the market is the balance that it provides to the hands while holding the grip. We can attest to the effectiveness of this model in the prevention of excessive tension in the wrist, forearm and other muscles of the body. This product is designed to give you more control of the direction and torque of the ball by giving you a feeling of comfort while wielding the club. It has a diameter of 1.67 inches which makes it be ranked among the thickest golf grips in the market. You will appreciate the ease at which it aligns with a club shaft. We also liked the soft and comfortable feeling that the grip offers. However, it is one of the best golf grips in terms of durability and ease of maintenance. This model features a large grip which feels soft and comfortable in the hand. The wide diameter allows you to make high-speed swings at a low force. It helps to balance the pressure in the hand while in turn preventing much tension in the wrist and forearm. Despite its numerous advantages, it is not very suitable in wet conditions since it becomes slippery when wet. This is another Putter Grip that will offer you a balanced swing while you maintain a normal tension on the wrist. It has a diameter of 1.2 inches which is small enough to provide you with a comfortable grip needed for a smooth swing. The outer layer is made of a tacky Polyurethane material which enhances its soft feel and its durability. In addition, it features an exclusive Parallel Technology which makes your strokes consistent in each swing. Another interesting feature of this product is its surface texture which provides you with enough traction to prevent your hands from slipping during wet conditions. Also, the product is lightweight which gives you the maximum feel needed for the perfect club. You will appreciate the level of success that you can achieve in the game of golf because of the advanced technological design of the grip as it features the popular EVA foam which is used in almost all the Putter grips. This is one of the few golf grips that have been approved by the USGA. In addition, the oversized grips allow you to enjoy a balanced pressure between the two hands and in turn minimizes wrist action by engaging the stronger muscles during the stroke. The No-taper technology which is used in its design enables you to enjoy a smoother, reliable and consistent stroke. The Death Grip is among the latest golf grips that are produced without the taper technology. It comes with soft surface texture to provide you with the comfortable feel that is needed for a reliable and consistent stroke. Also, in the design, it uses the tacky Polyurethane material in its outer layer to enhance your comfortability and confidence in the grip. It will interest you that it uses the EVA foam to maximize your comfort and feel. We also liked the lightness of this product which reduces the pressure on the wrist and other muscles of the hand while stroking. You will also appreciate the unique designs on the grip; that includes the beautiful colors which matches with your sports outfit. In addition, it uses the parallel technology to provide your hands with a balanced pressure while reducing the pressure on your wrist and hand muscles. Another feature that is worth noting is that it has a shock absorption rate of 65% which is higher than those in rubber grips. The high absorption rate allows it to reduce tension in the hand, muscles and protects the body from damage. It is recommended for use if the hand is a little uncomfortable or strained. Its anti-slip force is greater than rubber by 40%. This product incorporates one of the latest technologies in the design of Putter golf grips to the benefit for your overall benefit. The No taper technology allows you to have a firm grip for a smooth, accurate and reliable stroke. It has one of the best shock absorption rates when compared to its competitor in the market which helps to reduce the impact on the hands while protecting the body from harm. Finally, this product is the best for persons who are a little uncomfortable with their hands. This is another model from Winn production line that is made of the Excel polymer material. It is designed to provide you with the best feel and comfort. It will interest you that this product has one the best absorption rates which protects you from the shocking vibrations that come with your high-speed swings. Thus, it is the best golf grip for persons suffering from arthritis and other hand fatigue. What we liked about this golf grip is its aesthetics which enables you to choose from the various colors that suit your taste. In addition, the polymer shaft is designed with a passage for airflow to increase its comfortability in the hand. You will appreciate the tacky feel with the Excel wrap grip. Also, you can choose a grip contour that suits your desire. The major advantage of this model from Winn which we cannot ignore is that it is one of the cheapest golf grips on the market. This product is designed to offer you the needed encouragement for a high-speed swing. It gives you an extremely tacky feel which is needed while playing in harsh weather conditions. In addition, it comes with a very high absorption rate which helps to protect your body from excessive tension that is associated with long distant swings. Finally, this product is recommended for golfers who have hands that are easily fatigued or are suffering from arthritis. This is one of the most used golf grips by professional golfers. It is made of 100% rubber and is available in the standard size. It does not only provide you with the needed grip but is designed to help increase your proficiency in the game. One of the things we liked about this model is its innovative hybrid grip which consists of a soft rubber and brush cotton. In addition, it comes in different colors that add a unique look to your sports kits. The Gold Pride Decade Multi-Compound Grip hybrid material makeup allows you to have a comfortable and reliable feel. You will appreciate that this model works perfectly in humid weather conditions. Let’s consider what you can achieve with this grip. The handle feels very tacky to enhance your power and downswing. Moreover, you will discover that the tension on your wrist, hand muscles, and the body is reduced to enable you to maximize your performance. However, the bottom of this grip is larger in size than the top; a feature which some of the new and experienced golfers did not like. Nevertheless, this design allows you to enjoy a lighter grip with the club. This model is one of the most popular golf grips in the market. It features an innovative hybrid grip that does not only enhance your performance but with the rubber and cord design, you are sure to enjoy an exciting look and feel. It feels tacky in all weather conditions. The lightweight and soft feel allow you to have more control of the swing and the club’s responsiveness. The size of the grip is standard which implies that it can be used by both professional and amateur golfers. Most professional golfers engage the services of professional club makers to assist them in changing grips either at a retail shop or in the golf course. It is interesting that you can change your grip yourself with little or no difficulty. However, you will need grip tape, solvent, golf tee and a tool to take out the old grip. The first step is to remove the old grip using the right tool then clear off any tape that is found on the shaft. Wrap a new tape on the shaft from the bottom up. Now, you should insert a golf tee at the end of the grip and then add a little solvent to coat the inside. Pour the remaining solvent from the grip over the tape until it covers everything. 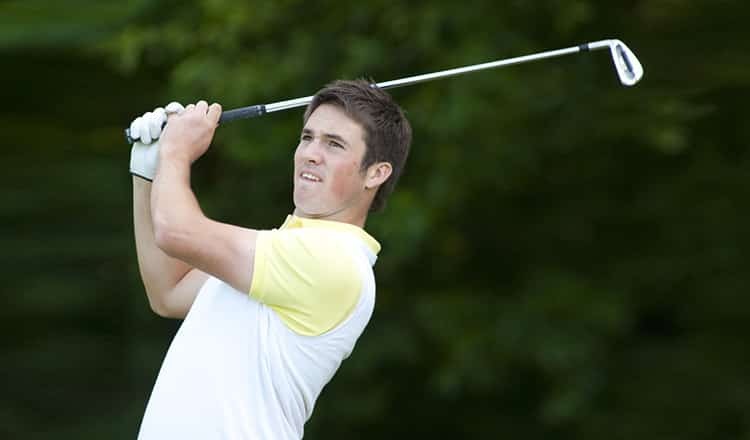 Ensure that the grip is properly aligned before pushing it through the shaft. After this, keep the grip for about 24 hours before you start using it. Keeping your golf grips dry and clean will help prolong its life. You should be careful to store it in a dry and cool place. Hot or damp environment and oil from your palms can degrade your grip’s tacky feel faster than expected. Leaving your grip in your car’s trunk, especially when it is hot will cause it to wear out quickly. When you want to clean your grip, apply mild dish soap and a soft brush. Wash the grip in the soapy water, scrub it gently with the brush then dry it completely using the towel. It is possible that the towel may not put off the water completely, you should not use the grip until it becomes very dry. The game of golf can be very interesting when you have the perfect grip. This is because the grip is the only link between your body and the club. Your foundation in golf starts with the grip which can influence your achievements in the game. To perform at your best while enhancing your skills in the game, you should get one the best golf grips that match with your play style and size. This best golf grip review is to serve as a guide to help you while shopping for the perfect grip. 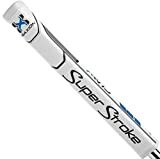 The Super Stroke Slim 3.0 Putter Grip is the best among the top golf grips because of its excellent features which makes it an excellent choice for both professional and amateur golfers. It comes with a slim diameter which allows you to enjoy more precise, powerful and controlled swings. In addition, the Winn Dritac Golf Grip Dritac was our top pick based on price to quality ratio. Aside from its top features, it is the best golf grip for persons who are living in rain-prone regions. However, you will have to practice with a grip to know the one that is for you. The most important thing to consider before or after buying a grip is the comfort, once you do not have the right feel, get a new another quickly. What Size Golf Grip Should You Choose for a Perfect Shot? 3 What Size Golf Grip Should You Choose for a Perfect Shot? 7 How to Use a Red Dot Sight for Utmost Shooting Accuracy? 8 How to Aim A Long Bow for Perfect Shot Every Time? 9 Holographic Vs Reflex Sights: Learn the Key Differences in Just A Minute! 10 How Do Holographic Sights Work? Learn in Just 5 Minutes!